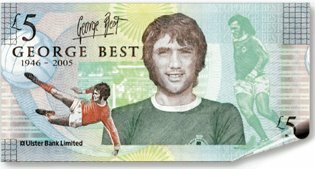 When Ulster Bank put George Best on it. Some North American readers may be labouring under the assumption that Freddie Adu, fine young fellow he may be, is the original child footballing prodigy. Let the clip below disabuse you. Bring your Pelés, Cruyffs and Maradonas, stick them in the Northern Ireland team this man had to play in and then make your comparisons. Those hoping for something in the vein of Elmore Leonard were disappointed by the 25 October Federal Open Market Committee (FOMC) press release. Despite the presence of the right mix of economic elements necessary for a thriller there is no doubt as to the bland authorship. The statement is clearly their own work, copied around the table (a few times) for agreement before release. Unemployed skilled ghostwriters up and down the USA remain glum: they too could have left all options on the table but at least given us all a nice ride on the way there. Style, of course, is one matter, content another. 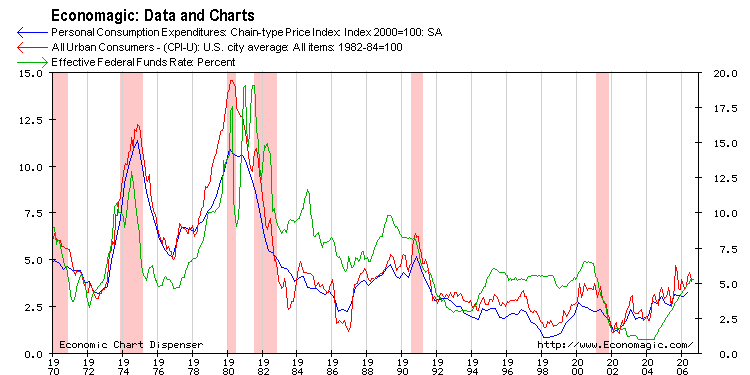 Some commentators argue the FOMC’s actions do not matter much. 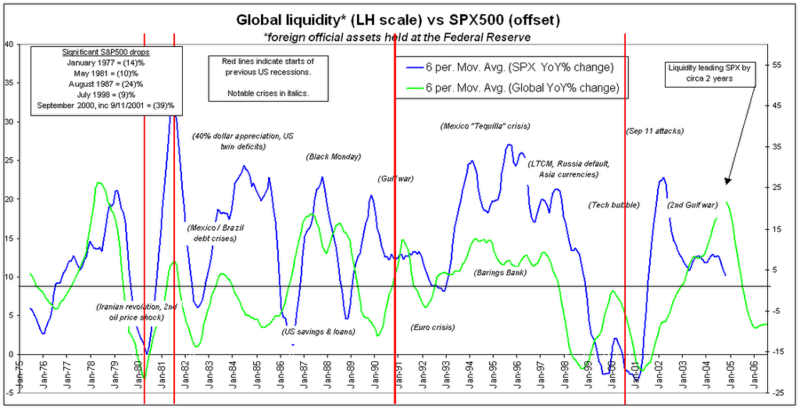 Indeed, that its power is perceived as key to most investors is odd given a demanding fiscal environment outside its control (particularly those elements of which are politically driven) and a US sovereign debt market dominated by foreigners. 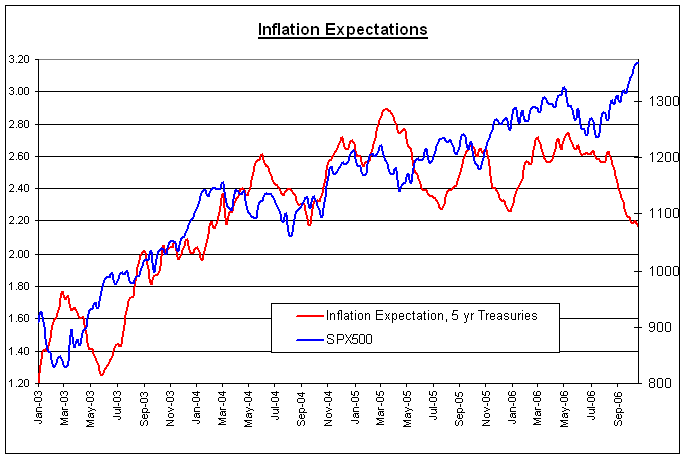 In mitigation to this general obsession with the FOMC and its fixation on “contained inflation expectations” here is a small, graphical comment. Yet the release remains a bestseller in financial circles. Hedge Fund investors have the majority of their funds invested in some sort of market neutral strategy. Notably, the term 'hedge fund' is both a legal structure (as opposed to a mutual fund) and an investment style. Nearly every firm that uses a hedge fund or market neutral style is legally organized as a hedge fund (and thus only open to accredited investors). Many are offshore funds that are unregistered, have no investment limitations, and are not subject to disclosure regulations. 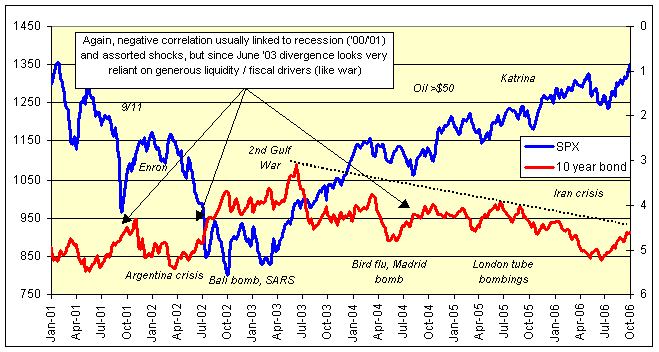 The common element is that any long position taken in a specific equity is offset by a short position in either a merger partner (risk arbitrage), an 'overvalued' member of the same sector (long/short paired trading), a convertible bond (convertible arbitrage), a futures contract (index arbitrage) or an option contract (volatility arbitrage). Because of the idiosyncratic nature of these investors, the fundamentals of their portfolios are not indicative of their investment styles. Thomson Financial categorizes these portfolios based on its specific knowledge of the their historical investment behavior. Are you confident your pension trustees' / managers' holdings in certain “legally structured" hedge funds are deployed as described above? Apparently those investing with Amaranth were. FT.com launches a new service next Monday called Alphaville: instant market insight. Currently on a dry pre-launch run (and already under scrutiny from rivals) the service, in broad terms, pushes two themes - its timeliness and its added value commentary (which also has a daily interactive aspect). The FT/Alphaville team, led by Paul Murphy, has envious resources, contacts and experience at their disposal; and that combination has the potential to turn Alphaville into a precious tool for market followers. The site deserves a close look. I received, unfortunately, no recompense (pecuniary or alembic) for this plug....but Alphaville did say something nice about Capital Chronicle this morning. Upon being told this scribe lives near Grenoble some people do a double take and reply, “What?! Cher-nobyl?” Much the same mystified why-would-you-want-to reaction takes place when people chance upon iSoft plc shareholders. Welcome to my world. To sketch some context, iSoft is The Major Supplier of hospital software in the UK (60% of revenue) where they have no sizeable competitor. Earlier this year former management was caught cooking the books. The company has enjoyed bad press since, and carried the political can (partly justified) for implementation delays and gremlins on the largest non-military IT project the UK has seen. iSoft came close to financial death as a result, and is yet a hospital job. Thanks in large part to its non-implicated, newish and well-connected Chairman (John Weston) it has put the beginnings of a survival platform in place. Nonetheless, long-term shareholders have been badly singed, and the firm needs to recapitalise its balance sheet in order to deleverage and stave off a liquidity crisis. At today’s AGM permission will be sought to issue equity. It’s likely that before year-end iSoft will then either make a rights issue, an open offer, or some combination involving perhaps an open offer and a conditional placing. The choice is important. 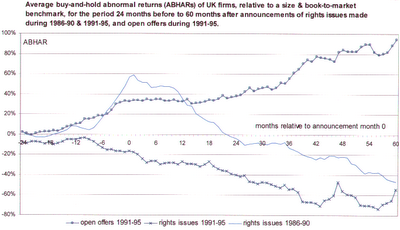 Rights issues are typically followed in the UK by underperformance for up to five years. Open offers, contrastingly, enjoy outperformance. 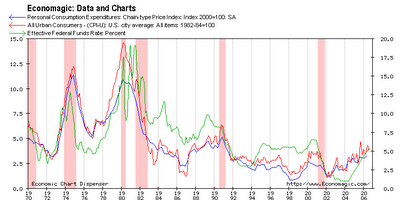 It is tempting to conclude that the choice of financing determines the subsequent performance. In fact, the choice reflects the underlying context of the company; and this context drives ex-post performance. The “context factors” include such things as director’s interests, growth prospects, degree of financial distress, appetite for rights, anticipated use of funds and so on. An isolated, financially distressed iSoft may not have enough shareholder support for anything other than an aggressively discounted rights issue, and the volatility of its equity supports this outcome. However, the company may not be as isolated as it seems. In this morning’s pre-AGM statement Mr Weston referred again to trade and financial company interest in iSoft. Gleacher Shacklock and Morgan Stanley have been appointed advisors and discussions are opening. This might be interpreted as is a sign of confidence in the company’s inherent worth (most notably its install base/UK market share) and implies both non-shareholder investment demand and, possibly, eventual refinancing on gentler and more confident terms than some analysts anticipate. On the other hand, it might not: what form the re-financing takes and who participates are, in the shorter term, crucial. 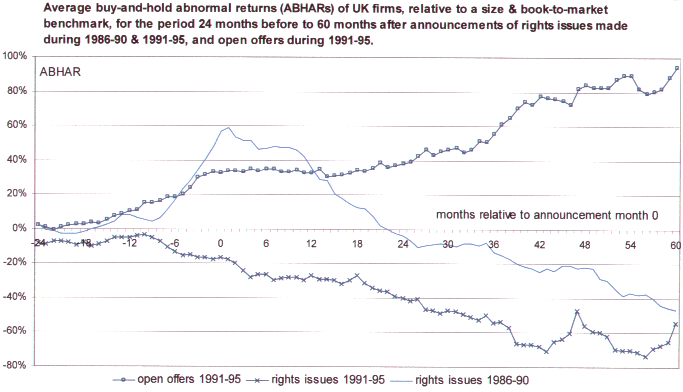 Sources: Ngatuni, Capstaff and Marshall, Long-term Performance Following Rights Issues and Open Offers in the UK (1986-1995); Kortewg and Renneboog, The Choice between Rights-Preserving Issue Methods, 2003; Armitage, The Proportion Underwritten and the Reaction to Share Issues, 2000. 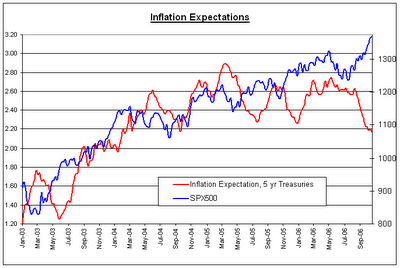 Equity and bond prices have had a particularly strong positive relationship since 1980. Which is normal – quiet, uneventful macroeconomic growth sees equity and bond gambol, hand in hand on a flame of desire, upwards. Since June 2003, though, the two have been falling out and equity has gamboled alone ever higher. Where is the love? Such splits are not unknown. Spats (negative correlation) typically occur when uncertainty and doubt creep corrosively between the lovebirds. 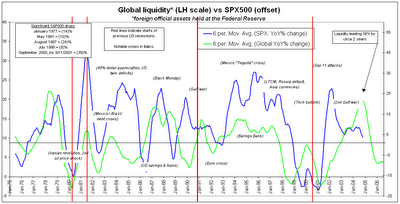 What are more unusual are long term separations. The period 1996 to end 2000 was especially difficult for the couple. The movement of one explained less than 40% of the movement of the other. In the preceding 15 years they’d hung out together over 75% of the time. 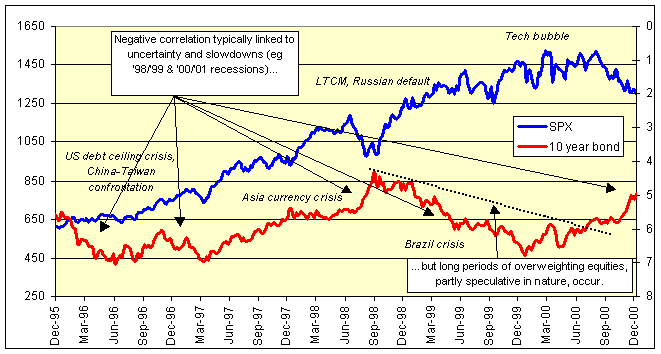 In particular, they grew apart from late 1998 as Mr Equity’s substance abuse problem (liquidity) began in earnest following a series of confidence-sapping encounters involving Asian currencies, Russian debt and the cleverest hedge fund ever. 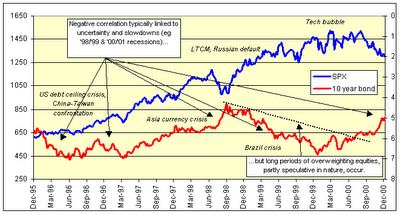 Abruptly, from 2000, it became more difficult for Equity to get high. 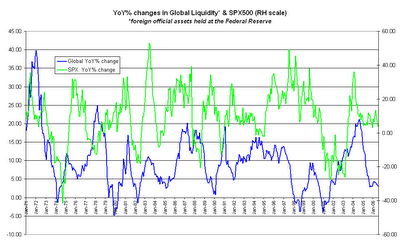 By the end of the year liquidity dealers were even raiding users and Equity got the withdrawal shakes. But Ms Bond seemed to be making a new life for herself and by 2003 was a world away from the sad withered creature she had been in 1999. In a desperate gamble to get her back - and himself in a Good Place - Equity went back hitting the liquidity with a vengeance in 2002. For a time it was like old times for the couple. Sweet. Yet quickly Bond found it harder and harder to keep up with Equity. And when, by 2006, he had taken to giving her odd looks whilst humming wistfully “Don’t cha wish your girlfriend was a freak like me?” (stay on topic, right click) she knew something had to give. 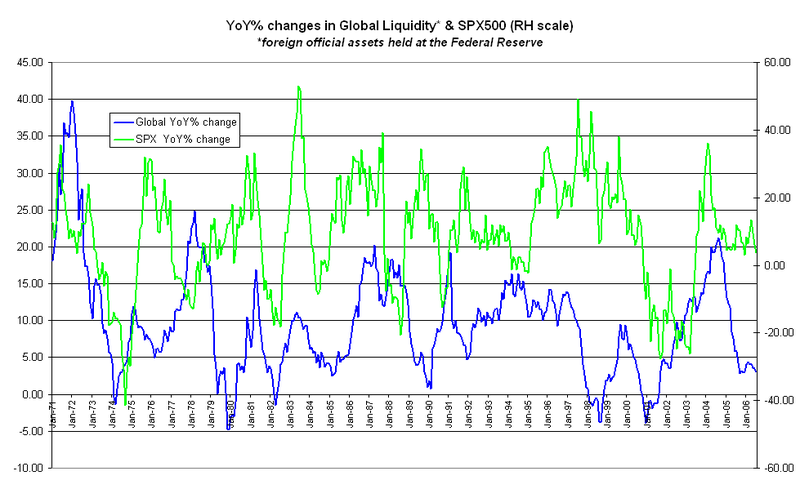 As did observers who knew, thankfully, Equity had begun easing off the liquidity. They just hoped the process wound down gently so everyone could get back to normal. HIOBs. Many visitors here are looking for guidance on the prospects of UK gaming stocks prospects, particularly PartyGaming (PRTY). Some things are clear for them; the US is 75% of rev and 50% of custom - they are losing good clients; the massive $500m revolver negotiated last time they reported is surely subject to review by lenders; it will be very difficult to raise replacement debt on favourable terms; or tap markets for fresh equity without a large discount; they have already cancelled the interim dividend, not as good a sign as they have spun it; and, bar Presidential refusal to sign the Senate bill (chance would be a fine thing), it is unlikely recovery will be quick. One glimmer of hope is that they are now, ironically, takeover targets from big US casino operators. However, the risks of this sector are now plain to see (even to those who did not read the PRTY prospectus) and outweigh the immediate odds of white M&A horses charging to the rescue. Update: A PartyGaming plc shareholder / potential shareholder? This may interest. And the improbable moves closer to reality, pending Presidential signature. Monday morning expect the UK gaming plc's to take a serious spanking. Senator Frist's legislation may be vague (poker sites appear to have room for argument on the basis that it is subject more to skill than chance); it may not amend the equally vague (for non-sports wagers) 1961 legislation; it may be close to unenforceable for the financial institutions it is aiming at; and it may be a violation of WTO treaties (there is talk of a pro-gaming legal challenge). But it looks like it will become law on signature plus 270 days unless President Bush sends it back (don't bet on it). And that will make operations a great deal more complicated for the UK's gaming sector. The text of the amendment can be found here, on pages 213 to 244.